This article consists of an exegetical investigation of Psalm 110 and assumes that the psalms function in one sense as prayers, which can be prayed authentically by modern worshippers. Consequently, the specific images of hostile acts of war present a challenge as prayer. The methodology involves the investigation of the text from a grammatico-historical perspective by using selected sources from the 19th century to the present. The meaning of the violent images of enmity and the defining characteristics of the enemy are determined through understanding the perceived suffering of the psalmist. Special attention is given to the role of the phrase יְהוהָ נְאֻם, the identification of לאַדנִֹי and defining the enemy. The conclusions of the exegesis support a more traditional interpretation of לאַדנִֹי and characterise the recalcitrant enemies in an eschatological framework. Hierdie artikel is 'n eksegetiese ondersoek van Psalm 110 en gaan van die veronderstelling uit dat die psalms in 'n sekere sin gebede is wat deur moderne gelowiges gebid kan word. Die spesifieke uitbeeldings van vyandige oorlogsdade stel egter 'n uitdaging aan dié gebed. Die metodologie behels die ondersoek van die teks vanuit 'n grammaties-historiese perspektief deur uitgesoekte bronne vanaf die negentiende eeu tot tans te gebruik. Die betekenis van die geweldadige uitbeelding van vyandigheid en die omskrywende karaktertrekke van die vyand word bepaal deur die verstaan van die waarneembare lyding van die psalmskrywer. Daar word besondere aandag gegee aan die rol van die frase נְאֻם יהְוהָ, die eiening van לאַדנִֹי en die omskrywing van die vyand. Die slotsom van die eksegesis ondersteun 'n meer tradisionele interpretasie van לאַדנִֹי en tipeer die onversetlike vyand in 'n eskatalogiese raamwerk. Psalm 110 is categorised by most modern scholars as a royal psalm.2 On a linguistic level the psalm presents many semantic and syntactical challenges. On a theological level, the psalm becomes problematic once the specific imagery of hostile acts of war is taken over as the basis of authentic prayer.3 Yahweh is portrayed as violently judging the nations through the means of his throne partner who is both David's lord ('אְַדנֹיִ)4 and Melchizedekian priest. Yahweh's throne partner heaps up (מ לֵָ֣א) corpses (ג וִּיו֑תֹ) and shatters (מָח֥ץַ) the heads (רֹאשׁ) over the wide earth (עלַ־ארֶץֶ רּבַהָֽ).5 Despite these images, Psalm 110 is the most frequently quoted and alluded to Old Testament text in the New Testament.6 Furthermore, the lord, who is addressed in the text, has traditionally been understood as the Messiah7 whom Christians identify as Jesus. The notion of a warrior-God, who sanctions violence in overcoming enemies, becomes directly connected to Jesus, which confronts the Christian who wishes to understand what it means to pray these violent images. The goal of this article will be to determine the meaning of the expressions of enmity by determining the perceived suffering of the psalmist as it is portrayed in the text of Psalm 110. Special attention will be given to the function of the phrase יהְוהָ נְאֻם by comparing its occurrence in Jeremiah. The identification of לאַדנֹיִ, the characterisation of the enemy and the chronological frame of reference reflected in Psalm 110 will also receive special consideration. until I put your enemies as your footstool." 2. The LORD sends out from Zion your mighty scepter. "Rule in the midst of your foes." 3. Your people will offer themselves willingly11 on the day of your battle. 4. The LORD has sworn and will not change his mind. The structure of Psalm 110 has generally been thought to reflect two distinct sections each beginning with an oracular introduction (v. 1 and 4) followed by expansions (Allen 2002:113; Waltke & Houston 2010:500-501). This position is well-supported by reference to the same number of colas in both oracles and the same number of colas in both of their amplifications (v. 2 and 8 respectively), stylistic use of Yahweh (v. 1a and 4a) and Lord (v. 1b and 5a) (cf. Allen 2002:113). Further support of two distinct sections comes from the use of volitional verbs in verse 1-3, (רְדהֵ ,ישְִׁלחַ ,שֵׁב), and in verse 4-7 the use of perfective (מלֵָא֣ ,מחַָץ֖ ,נשִׁבְַּע֤) and non-perfective verbs (י רִָ֥ים ,ישִׁתְֶּה֑ ,ידִָי֣ן). The use of three of each type of verb should probably not be considered coincidental. However, suggesting that the psalm has two parallel units or strophes can act to downplay the importance of any dominant element. On closer examination it may be possible to suggest a central emphasis in the psalm. Auffret (1982:83-88) proposed a double concentric structure of Psalm 110, one of which centered on 4a α, the oath formula. Hossfeld and Zenger (2011:146) also make the comment: 'Without v. 4 there would be a coherent textual and historical continuum.' Further evidence for the importance of the oath formula comes from reconstructing what the hypothetical prophetic oracle may have looked like in its pre-liturgised form. That is, if the oracle formula and oath formula were separated from their expansions and combined according to the principles observed when they occur together in the book of Jeremiah (see below), then the emphasis would fall on the content of the oath formula and serve to highlight verse 4, the Melchizedekian lineage of this person. The structural location of Melchizedek at the center of the psalm is significant in this regard. Structurally, the placement of verse 4 in the middle of Psalm 110 parallels its placement in the middle of the narrative account of Abram's defeat of the Canaanite kings in Genesis 14, which strengthens the allusion. I suggest that in Genesis Abram's encounter with Melchizedek functions in one regard to legitimate the claim that Abram has to wage war against the Canaanite kings. The covenant had not been ratified as of this time and so this is a pre-ratified legitimation of Abram's right to possess the land. However, it should be noted that the psalm portrays the Messiah's right to rule beyond any right to rule according to pre-exilic boundary markers and includes the whole earth. In the Genesis text, Abram acknowledges Melchizedek's sovereign right by paying tithes (Von Rad 1972:180). We may conclude that the legitimacy of Abram's military conquest is then sanctioned by Melchizedek's blessing.16 Such an idea of legitimacy is then appropriated through the Messiah on whom this priestly title is conferred by Yahweh. The traditional Christian interpretation of this psalm until the early 19th century categorised it as a messianic prophecy. Waltke and Houston and (2010:74-75) note that Delitzsch (1830-1890) was one of the last German scholars to interpret Psalm 110 in a conservative orthodox way as a prophetic and messianic psalm. J.M. Neal (1818-1866) and Bishop Perowne (1823-1904) were his English counterparts. Kraus (1989:353) suggests that form-critical research has contributed to the rejection of traditional messianic interpretations in Psalm 110. Yet, according to Gunkel and Begrich (1998:103), classification of the royal psalms, unlike other psalm types, is based on 'their different causes'. In the case of Psalm 110 the different cause seems to be tied into understanding the implications of the phrase יְהוָה נְאֻםI.17Thus, caution must be exercised in making any assumptions based on what can be understood from the general knowledge of the royal psalms. Some modern scholars (Kidner 1975:427; Kissane 1954b:106) follow the New Testament witness to David as the author and speaker in this psalm and categorise it as a messianic prophecy. However, the general tendency can be seen in Allen's statement (2002:113) that restricting the psalm to an original messianic intent 'hardly accords with the pattern of historical and theological development discernible in royal psalms in general and with the ancient cultural and historical royal references within Ps 110'. Waltke and Houston (2010:502) are correct in noting that academics, who deny Davidic authorship, reach no consensus about the date of Psalm 110. Comparison with similar prophetic oracles in Jeremiah shows that the psalm-form is a liturgical modification of the pure prophetic form. The phrase יְהוָה נְאֻם occurs 167 out of 267 times in Jeremiah.18 According to Rendtorff (1954:28), in Jeremiah, when the phrase stands alone, it functions as a conclusion to divine speech. However, when it is placed with another speech formula such as the oath formula נשִׁבְַּע֤, it is displaced from this concluding function and stands in an introductory position. This later situation is the one we find, albeit in a modified form, in Psalm 110. When it occurs, for example, in Jeremiah 22:5 and 49:13 (also found outside of Jeremiah, e.g. Gn 22:16) with the term נשִׁבְַּע֤, the phrase יְהוהָ נאְֻם; succeeds the נשִׁבְַּע֤ formula without intervening words. In this function it still introduces divine speech, but in a secondary manner serves to highlight the distinct function of the oath formula. In Psalm 110 the oracle formula יְהוהָ נאְֻם in verse 1 is parallel to the oath formula נשִׁבְַּע֤ in verse 4. Possibly, the altered placement of the terms in Psalm 110 and the expansion of the oracle before the oath formula may be due to the liturgical shaping of the psalm. The evidence for this modification of a pure prophetic oracle to a liturgical form is supported by comparison of Ps 110 with Assyrian enthronement oracles (see Hilber 2003:353-366, 2005:76-88). It is hard to know for certain to what extent David is responsible for the final form of the psalm.19 As Delitzsch (1975:187) points out, David had known of egregious sin in the midst of his military campaign against Ammon. Such a crisis could have been the impetus for his prophetic oracle, which was later reshaped into a liturgical psalm.20 Perowne (1966:299) suggests that it was composed to accompany the bringing up of the ark, of which David acted both as king and priest. Regardless as to its provenance, the poem's close structural affinity to Assyrian royal prophecies suggests that it functioned as part of royal prophecy in Israel's coronation ritual (Hilber 2005:76-80). Weiser (1962:693) suggests that it was probably used at the 'festival of the king's enthronement' and reflects a courtly style which was 'composed at a time when under the kings of Judah national enthusiasm was still a national and unbroken force'. According to Mowinckel (1962:48) 'the kings must be real Judean or Israelite kings in these psalms'. Allen (2002:113) tentatively suggests 'the psalm was composed to celebrate David's earlier conquest of Jerusalem'. The ideal of a co-regent with Yahweh, expressed in the term לאַדניִֹ [lord] (v. 1) became the benchmark by which Israelite kings were to measure up. When we talk about the perceived suffering of the psalmist in this instance we mean the suffering of the lord21or Messiah of this psalm. In the first part of the psalm (v. 2-3) it seems fairly clear that the lord is the subject of the actions. However, regarding vers 5-7 scholars are divided as to who the subject of the actions is. The closest antecedent to the subject of verse 6 is the אדֲנ [Lord] of verse 5, and in verse 7 difficulties arise in assigning to the Lord the anthropomorphic language of drinking from a stream. Hossfeld and Zenger (2011:151), on a linguistic basis, believe there is no indication in the sequence of clauses (v. 5-7) to infer a change of subject. So the אדֲניָֹ [Lord] is the acting subject in the campaign against the enemy. Kissane (1954a:194) by interpreting עַל [because] as a conjunction in verse 5 instead of as the preposition at insists that it is the lord who is the acting subject of all three verses. 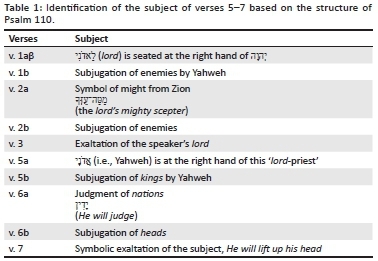 Waltke and Houston (2010:509) keep the subject of verse 5 as the Lord, but on the basis of semantic pertinence believes the subject of verse 6-7 to be the lord.22The structure of the psalm may lend support to Waltke's position. If we remove the kernel of the oracle, we find that the psalm contains parallel ideas. The parallel ideas in the table suggest that the subject of vv. 6 and 7 can be regarded as the lord of the first half of the psalm and not the Lord. The lord then is the object of the foe's hostility and engaged in a campaign against them. If we assumed that David originally had been 'prophesying', it would be difficult to determine the exact meaning he had for the terms for enemies אְדַניִֹ(v. 1ba and 2aß), מְלָכִיֽם (v. 5), גּוֹיִם (v. 6) and ראֹשׁ (v. 6).23 From a form critical perspective, according to the inner logic of the psalm, the אְדַניִֹ of verse 1 are the גּוֹיִם of verse 6 (Croft 1987:36). Thus, the general term for foes is given a more specific designation in verses 5-7 as the kings, nations and heads. The setting is a battle sequence. To begin with, the lord is enthroned at the right hand of Yahweh. The foes surround the lord and hence Zion on every side. Zion is the place where Yahweh resides with his throne partner. The enemy's attack on Zion reveals their complete antagonism to the rule of Yahweh and his throne partner. As in Psalm 2 the foes are positioned as the instigators. The mighty scepter (מַטֵּֽה־עֻזְּךָ, v. 2) is a symbol of the Messiah's right to rule, to fulfill Israel's covenant mandate to subdue enemies and bless respectful nations (Waltke & Houston 2010:505). At other times it is a symbol of Yahweh's justice (Ps 45:6, Is 10:5). In contrast it can be inferred that the enemies are unjust in their cause. The reference to the 'mighty scepter' coming forth from Zion may indicate hostility against the Messiah in a manner similar to Psalm 2 (a royal psalm) where the nations plot and conspire against the king whom Yahweh appoints in Zion. The subduing of the enemies, symbolised by placing them as your footstool, shows their determination. Such behaviour is only used to humiliate those who have been conquered. The battle sequence continues as the lord who was enthroned at the right hand of Yahweh now finds Yahweh standing at his right hand helping him in battle. The term (v. 5) is used in Psalm 2:5 to indicate God's wrath directed against his enemies to quell wilful resistance (Allen 2002:118). Hossfeld and Zenger (2011:150) note that the notion of God's wrath is not only an emotional category, but a philosophical category directed towards kings and rulers who flout the universal order. Perhaps Hossfeld and Zenger's placement of emphasis on God's wrath as a philosophical category makes the notion of God's justice seem disassociated from his character. However, Zenger's suggestion is important in understanding the relationship between the moral world order God has created and God's wrath. We can infer that the term must carry the same range of meaning for the co-regent. The picture of the enemy is that of a purposeful resistance to what the Messiah enthroned on Zion symbolises. On the basis of Psalm 2:1-2 and Ephesians 6:10-20, Waltke and Houston (2010:510) suggest that the rulers are empowered by demonic forces. The term ידִָין(v. 6) means to give right and just verdicts in contrast to the term שׁפת, which carries the notion of righting wrongs (Waltke & Houston 2010:511). The implication of this is that the cause of the nations, kings and heads is unjust, just as it was their conspiracy recorded in Psalm 2. The aftermath of the intense battle is that corpses are heaped up. The inference is that the enemies have been in active opposition to the Messiah, meeting him on the field of battle in intense warfare. Thus, the picture given in the psalm indicates that the enemy is antagonistic to all that Zion and hence the rule of God, stands for. There is no middle ground. The images are strong but decisive. The enemies appear as conquered unjust aggressors in the military action. The focus of Psalm 110 is on the utter defeat of the enemies by means of Yahweh's throne partner, which results in his world-wide universal rule. Although the battle begins with איבֵֹ surrounding Zion (צִּיּ֑וֹן; v. 2), it moves to the subjugation of the heads (ראֹש) over the wide earth (ארֶֶ֥ץ רַבּהָֽ v. 6). The aggression of the enemies is firmly responded to, as is seen in the symbols (enthronement, footstool, mighty scepter, wrath) justifying the right of the Messiah to utterly defeat them in battle. As mentioned above, justification for the Messiah's military action also comes from the allusion in verse 4 to his priestly endowment by Yahweh according to the order of Melchizedek. In the Genesis account Melchizedek blesses Abram before God ratifies his covenant with Abram, as mentioned in 13:14-17, and before the limitations on priesthood imposed by the Aaronic order.24 The allusion creates a chronological frame of reference, which moves the reader from a pre-covenantal time frame to Yahweh's throne partner's reign over the whole earth, supported by a nation of priests who are symbolised by their apparel, arrayed in holy splendor (בְּהֽדְַרֵי־ק֭דֶֹשׁ). Whether the text was originally understood as eschatological by those communities, which first used it in the cult, cannot be proved for certain.25 Eschatological perspective can be communicated through various emphases.26 In Psalm 110 neither the motifs of the ingathering of Israel, nor the universal peace portrayed in the ingathering of the nations, is of primary focus. Yet, removing the focus from pre-exilic land boundaries is of particular importance. The conflict now becomes focused on the defeat of the enemies, who are opposed to and seek to exterminate the rule of Yahweh's throne partner enthroned on Zion. Without concrete historical referents for these enemies, the older commentators may be understood for interpreting the singular רׁאֹש (v.6) symbolically as the 'head' or 'chief' adversary, namely Satan, or, as Hossfeld and Zenger (2011:150) suggest, figures of a universal power of chaos, which must be combatted and destroyed by Yahweh and his lord. The Messiah's defeat of the enemies establishes Yahweh's universal rule, which is grounded in the Messiah's pursuit of justice.27 The last verse of the psalm captures the completeness of his success: עלַּ־כןֵ ירָיִם רׁאֹש [therefore he shall lift up his head]. The complete earth falls subject to his rule. The hostile images of war are best understood in the context of the eschatological framework within the psalm. The nations are portrayed as actively and antagonistically engaged in battle against Yahweh and his throne partner, the lord. The imagery reflects the scope and underlying reality of the battle. The complete subjugation of the enemy is justified on the basis that the enemy has engaged willfully with the intention of, not only throwing off Yahweh's rule, but of destroying the place from which Yahweh rules, namely Zion. In the context of this eschatological profile the incorrigible and recalcitrant nature of the enemy is overcome according to Yahweh's right to establish his universal reign through his Messiah the lord. Christians who pray this psalm are merely presenting before heaven the reality of recalcitrant moral evil and the 'lord's' just mandate to rule. PhD promoter at GST, Rev Dr KM Rochester, and my NorthWest University promoter, Prof. Dr Herrie van Rooy. As given in footnote one. 1 This article originates from my PhD thesis entitled, 'Praying the language of enmity in the Psalter: A study of Psalms 110, 119, 129, 137, 139, and 149'. The article consists of a modification of the first third of an exegetical, historical and theological investigation of Psalm 110. I would like to thank my GST PhD promoter, Rev Dr KM Rochester and my North-West University promoter, Prof. Dr Herrie van Rooy. Dr van Rooy's suggestion that I explore the use of the phrase נְאֻם יְהוָה in the prophets, was particularly helpful. 2 'Königslied' (Gunkel 1926:481). For some examples of scholars who interpret it this way, see Firth and Johnston (2005:299). .
3 I am assuming that the psalms can function as prayer in the tradition of Athanasius, Diodore of Tarsus and John Chrysostom who all saw in the use of the psalms the voice of the Christian. 4 The term can refer to people or God in the Masoretic Text (MT) of the Old Testament, although according to The New Brown-Driver- Briggs-Gesenius Hebrew and English Lexicon (Brown, Driver & Briggs 1979: 10) this pointing with the first common singular suffix was used by the Massoretes to indicate a non-divine use. On the other hand, the pointing of, 'אדֲנ which is found in Psalm 110:5 always refers to God (Holladay 1997:4). 5 Hossfeld and Zenger (2011:145), on the contrary, suggest that whereas in Psalms 18 and 21 the king acts as warrior, here it is Yahweh who is the warrior. Scholars come to no consensus for who is the subject of these actions (see below). Nevertheless, whether Yahweh is the primary acting agent or acting through the king, he both sanctions the military activity and ensures its success. The sole agency of Yahweh does not preclude the involvement of the Israelite army according to the Hebrew concept of Holy War (Allen 2002:115). 6 Waltke and Houston (2010:484) suggest 25 times and Guthrie (2007:943) suggests 22 times. 7 This appears to be true even for those scholars, like Allen, who do not hold to an original Messianic intent. 8 The New Revised Standard Version (NRSV) is used as a base translation. However, lines are divided according to the accentuation in the Biblia Hebraica Stuttgartensia Masoretic Text (BHS MT). 9 NRSV uses the term says. 10 NRSV marks off with quotation marks 'Sit ... footstool', which limits the prophetic utterance to the end of verse 1. The grounds for this are prosopological - the apparent change of voice from 1st person to 3rd person in verse 2. However, as Hilber (2003:359) and Waltke and Houston (2010:499) have noted, in the Old Testament prosopological change can indicate change in perspective rather than change in the nature of the speech as is the case in Isaiah 3:1-4, Hosea 5:1-7, Amos 3:1-7, Micah 1:3-7. Hilber (2003:359) also notes that short Assyrian oracles can display a rapid shift in voice, although 'the entire speech was conceived as the word of the divinity'. 11 I am choosing to follow the MT in verse 3, although semantically and syntactically the verse has been the subject of many revisions. The The Septuagint (LXX) has μετά σου ή αρχή, which is retroverted to עמִּךְָ נדְבִתֹ and can be translated into English as 'with you is nobility'. This translation has the advantage of maintaining consistency within the context of the psalm (cf. Kissane 1954a:192). With the resonating between Yahweh and his throne partner in the rest of the psalm, the mention of 'your people' here seems out of place. However, if the LXX's translation of the last word in the verse יְלִדְתִּיךָ is rejected (see below), the MT text provides a consistency within the verse (Your people ... your youth, i.e. young men). 12 'Arrayed in holy garments' can be accepted over some medieval manuscripts (BHS MT:XLVII), the Targum, Symmachus, Jerome and the NRSV's translation, which has בהִרְַרֵי [in the holy mountains]. Kissane (1954a:192) argues that accepting the MT would place the Messiah under the Aaronic priesthood. However, if one follows the accenting in the MT, 'arrayed in holy garments' describes the youthful warriors who rally to this throne-partner of Yahweh. Furthermore, the reference to Melchezidek places the psalm in a pre-Aaronic time frame before the concept of priesthood was limited to the tribe of Levi. 13 The LXX reads יְלִדְתִּיךָ' [I have begotten you], which as Hossfeld and Zenger (2011:142) notes, becomes problematic if preceded by the words לְךָ טַל as are found in the MT, but not in the LXX. Since these two terms add complexity to the text, they most likely were not added at a later time and should be kept. 14 NRSV uses the phrase filling them with corpses. The English verb heap up eliminates the need for a double object and so reflects the MT. Proposals, which conflate Symmachus, Aquila (φαρανγγες, גאָיֵוֹת) and Jerome (valles) with the MT (גְוִיּוֹת), translated into English as 'he will fill the valleys with corpses', provide a more concrete image, but do not lessen the violence in the image. 15 MT is singular. However, the plural is attested to in some Medieval Hebrew manuscripts. For the singular ראֹש used as plural see Psalm 68:22. 16 The function of such an allusion in Psalm 110 would work on an argumentative justification, but not necessarily as a theological basis acknowledging any form of Canaanite pantheon just as, for instance, the statement in Psalm 136: ה֭וֹדוּ לֵֽאלֹהֵ֣י הָאֱלֹהִ֑ים [Give thanks to the God of gods], would not be a concession for any Israelite to the existence of other gods. This idea of divine mandate was common in the ancient world, for example, it was believed that 'Cyrus received his rule from the hands of the Babylonian gods' (Herrmann 1981:295). 17 Psalm 110, as an נאְֻם יְהוהָ [oracle of Yahweh], has no other comparable psalm. In the psalms, the term נאְֻם occurs only here and in Psalm 36:1, where פּשֶַׁע [transgression] is personified. The Today's New International Version (TNIV) translates Psalm 36:1 as 'I have a message from God in my heart', which captures the divine implied subject of the oracle. Waltke and Houston (2010:502) notes that the term נאְֻם occurs 375 times in the Old Testament and is used exclusively for divine speech. Gerstenberger (2001:266ff.) contests whether Proverbs 30:1; 2 Samuel 23:1 and Psalm 36:2 represent divine speech. However, see Waltke and Houston (2010:502) for arguments to suggest that even in these cases the נאְֻם can be understood as divine speech. For example, the term, נאְֻם is used for David in 2 Samuel 23:1 where it is clear that David is speaking through 'the Spirit of the Lord' (2 Sam 23:2). According to Bible Works 9, נאְֻם only occurs approximately 20 out of 377 times in non-prophetic books (Gn 22:16; Nm 14:28; 24:3 (2x); 24:4; 24:15 (2x); 24:16; 1I Sam 2:30(2x); 2 Sam 23:1 (2x); 2 Ki 9:26 (2x); 19:33, 22:19; 2 Chr 34:27; Ps 36:2; 110:1; Pr 30:1. 18 See Holladay (2002:245-261) for an example of how some scholars approach the issue of the literary dependence between the psalms and Jeremiah. The very nature of this debate itself suggests that understanding the function of a particular form in one book can illuminate its use in another. 19 Furthermore, if David were carried away in a state of uttering prophecy, as Perowne (1966:288-289) noted, we cannot be sure as to how he perceived the exact meaning of אְדַניִֹ The inherent semantic range of the term always involves deference to the one who is addressed. 20 The details of this ceremony would be open to speculation and are not necessarily important to our understanding of the meaning of Psalm 110. For a review of possible suggestions of the king's role prior to the exile in such a ceremony, see Shirley Lucas' chapter (2011:66-93) entitled 'Kingship in the Hebrew Scriptures: The Psalms'. 21 The use of the term lord corresponds to the Masoretic pointing of אְדַניִֹ, whereas the term Lord corresponds to the Masoretic pointing of אְדַניִֹ. 22 Kirkpatrick (1921:669) suggests that in verse 6 the subject is the Lord because of the use of the term [he will judge]. This term is used of Yahweh in Psalm 7:8; 9:8 and 76:9. However, if the lord is the throne partner of Yahweh, the collation of the verb judge with the lord as subject should not be considered unusual. 23 The implied eschatological argument in this paper is not dependent on the extent to which David is responsible for the written text of Psalm 110, or whether it is indeed David prophesying. 24 Gillingham's suggestion (1998:228) that the eschatological focus in Psalm 110 functions by reflecting on the past Davidic dynasty in order to 'uphold the legitimacy of the Temple, and with that, the worship of God there', does not take into account the different focus to which the reference to Melchizedek draws the reader. The reference to Melchizedek takes the reader outside of the historical reference frame of the theocratic state established by David. 25 Hossfeld and Zenger (2011:149) comment: 'It is rather doubtful that here, as throughout Psalm 110, a concrete historical situation is in view.' Gillingham (1998:224) opposes viewing this or any of the psalms eschatologically, because there appears to be very little Messianic awareness in other pre-exilic material. Such a position a priori does not take into consideration the uniqueness of the phrase םאֻנְ הוָהיְ. 26 According to Mitchell (1997:151-152), a tripartite eschatological schema is found in Ezekiel, Zechariah, Joel and also in the structure of the psalms. This schema consists of the ingathering of scattered Israel, the gathering of the nations against Jerusalem, and the ingathering of Israel and the nations to worship in Zion. I am working from the position that the psalms must have integrity as individual units, because they are used as such. In this instance Psalm 110, by itself, does not contain the full-fledged eschatological programme that Mitchell sees in the over-arching structure of the psalms. However, the lack of certain images does not mean that the psalm is not eschatological in its framework. 27 Perhaps the mandate in verse 2b, Π7Ί [rule], also alludes to that given in Genesis 1: 26 and 1:28.